SQL Server 2016 has added a couple of nice new options to the setup experience. First they added the ability to have multiple tempdb files on install, a nice time saver for later. And now, with CTP 3.0 they have added the ability to enable IFI on install. What is IFI, and how do I get it? IFI stands for instant file initialization, and if you are not aware, enabling this allows SQL Server to grow data files almost instantaneously. Without this enabled the data file space has to be claimed and then filled with zeroes, something that is a long and arduous tasks, especially on slower spinning media type storage. This is only relevant to data files, for security and integrity reasons the log files still need to be zeroed out. Enabling IFI is actually quite a simple task, you just need to add the SQL service account to the Perform Volume Maintenance Tasks section of the Local Security Policy and then restart the SQL Server service. What does SQL 2016 do differently? Prior to SQL Server 2016 (CTP 3.0) you would need to manually add the SQL account to the Perform Volume Maintenance Tasks (PVMT) section of the Local Security Policy (secpol). Now you can have the installer take care of this for you. That really helps with not forgetting to do it later, which can cause some serious performance problems down the road. As a person who messes with SQL Server there is a pretty strong probability that you are using SQL Server Management Studio (SSMS). It is a very full featured tool, but does have a couple of problems and quirks (like crashing on large result sets due to it reaching the maximum memory allocation for a 32bit process). Hit a strange issue this morning. I was working with one of the network guys testing out connecting to SQL behind an F5 load balancer, something I’ve done multiple times previously. I was able to connect using SQLCMD, Invoke-SQLCmd and using a UDL source, but for some reason, every time I tried to connect using SSMS I would get an error stating that an “Index was outside the bounds of an array”. 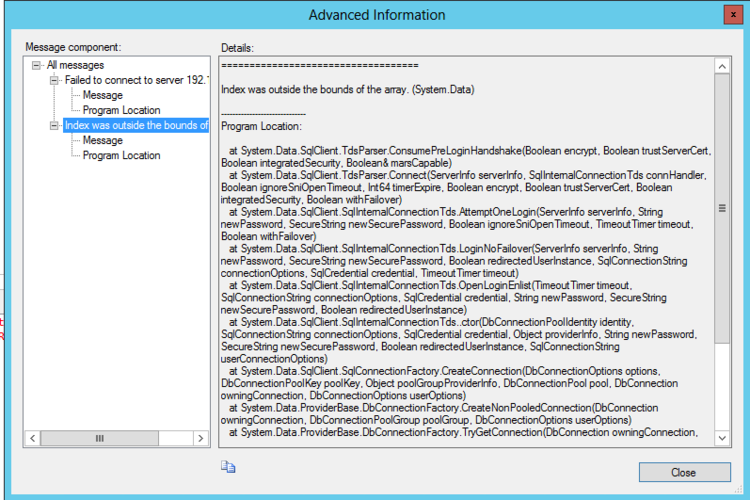 A little research showed that this error cropped up when trying to connect to SQL 2012 from an earlier version of SSMS. This wasn’t the case here though, everything was SQL 2012, and I was able to connect to the server directly without any problems, it was only an error when going through the F5 VIP. After a little work and research with the network admin we discovered that OneConnect was causing the issue. It was attempting to pool connections and was causing the problem, turning it off fixed the issue entirely. Just something to keep an eye out for if you use F5’s to handle load balancing or DR client redirection. I came across a very strange issue with replication this weekend. As a part of a release a new table was being created with extra columns and a view was created with the old table name that referenced the old column set (so as not to break old legacy applications). This table was replicated. The dev team provided us with scripts to setup replication. During the attempt to perform the snapshot I ran into some problems and so dropped the publication. All of a sudden users started to complain that they could no longer see the view and couldn’t query the data. I looked, and sure enough the view was not there. Very strange. I told the users that I’d get it created again once replication was done. I redid the publication and the users called me saying not to worry, the view was back. After digging through I found the cause of the issue. The dev had created the replication scripts and included a filter to eliminate certain columns. This replication then gets wrapped into an article view. In this case the dev had manually named the @view_name in sp_articleview to be the same as the view in the database. This caused SQL to drop the existing view and create it’s own. When the publication was dropped so was the view. Now let’s create a publication for replication with column filters against the SQLBuilds table. We’ll specify the @view_name to be Bananas. I’m also including an @filter_clause to eliminate rows (I’ll explain that in a bit). This appears to be a bug and not the behavior I would expect. Msg 2714, Level 16, State 3: There is already an object named ‘Bananas’ in the database. Cannot generate a filter view or procedure. Verify that the value specified for the @filter_clause parameter of sp_addarticle can be added to the WHERE clause of a SELECT statement to produce a valid query. The current transaction cannot be committed and cannot be rolled back to a savepoint. Roll back the entire transaction. Something to be aware of if you are going to be playing with replication. I’ve opened a Connect bug with Microsoft to try and get this fixed. Please go vote on it. And be careful with your replication.